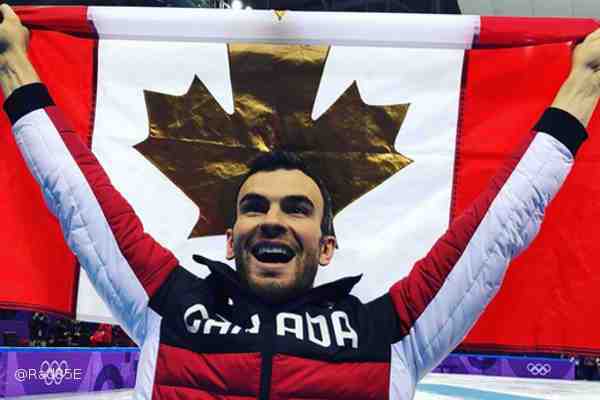 Canadian figure skater Eric Radford has won gold at the Winter Olympics in South Korea, making him the first openly gay man to win a gold medal at the Winter Olympics. Radford and skating partner Meagan Duhamel came in first place in the free skate program in the team event. Their routine Sunday morning was set to Adele's Hometown Glory. Radford, 32, came out gay in 2014 after he and Duhamel finished seventh at the 2014 Winter Olympics in Sochi. U.S. figure skater Adam Rippon, 28, won a bronze medal as part of the team event. He came out gay in a 2015 interview with Skating magazine. Radford and Rippon are among just a handful of out athletes competing in South Korea. Skier Gus Kenworthy is the second out athlete on Team USA. Rippon and Kenworthy have been outspoken in their criticism of Vice President Mike Pence's role in the Winter Olympics.